Quick drying, long lasting, water repellent matt finish. Suitable for exterior use. Johnstone’s Woodworks Decking Stain provides 3 years all weather protection to new and previously stained decking and cladding. The wax enriched formulation gives a one-step water repellent finish that is quick drying, long lasting and helps resist cracking, peeling and fading. Adds a coat of colour and dries to give a tough matt finish whilst protecting against mould and fungal growth. 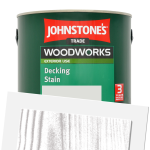 Johnstones Trade Decking Stain is available in 4 colours from the Johnstones Trade Colour Cards. Ensure the surface to be stained is clean, dry and free from dust, grease, polish or any other coatings such as paint or varnish. Nail and screw heads in joinery should be set below the surface and concealed by a suitable wood filler. New untreated soft wood should first be treated with Johnstone's All Purpose Preserver. For previously painted or varnished wood, remove all traces of previous coatings before staining. Use a paint & varnish stripper to remove traces of previous treatment then treat as for bare or new wood. Avoid the inhalation of dust. Wear a suitable face mask if dry sanding. Special precautions should be taken during surface preparation of pre-1960's paint surfaces over wood and metal as they may contain harmful lead. 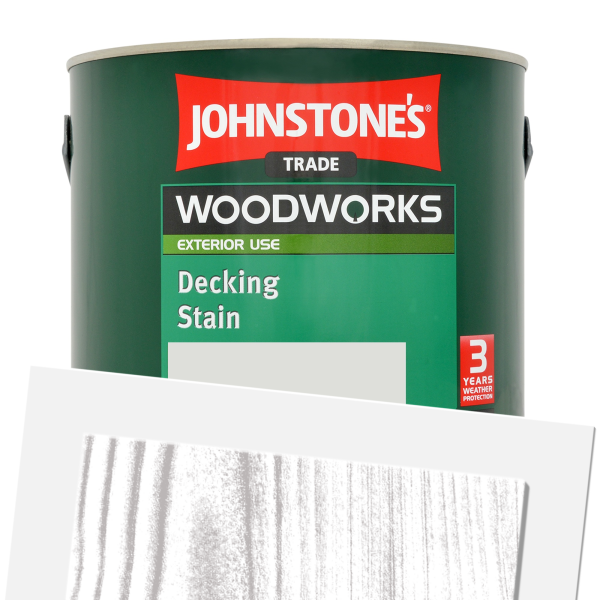 Stir Johnstone's Decking Stain well before use. Apply evenly with the use of a brush or pad working well into the timber and along the grain. 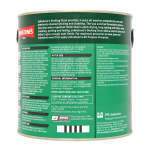 Apply two coats to bare and previously preservative treated timber. Redecoration requires one coat. Under normal conditions Johnstone's Decking Stain will cover approximately 12 sq. metres per litre. in adverse conditions. Do not apply in temperatures below 10°C, in damp conditions or if rain is imminent. Remove as much product as possible from the application equipment before cleaning. Clean equipment immediately after use in warm soapy water and rinse thoroughly. Replace lid firmly after use. Do not empty products into drains or watercourses. Some local authorities have special facilities for the disposal of waste coatings. To avoid the risk of spillage, always transport this container in a secure upright position. Lift with care - gross weight does not exceed 4 kilograms.